"I make this curry with chicken, coconut milk, tomatoes, and carrots usually on busy weekends when I have projects around the house and no time to cook." Combine chicken, tomatoes, coconut milk, carrots, onion, garlic, curry paste, ground almonds, and 4/5 of the cilantro in the slow cooker and close the lid. Cook on High until chicken is cooked through, about 4 hours. If sauce is too thin, mix cornstarch with water in a small bowl and stir into the sauce. Cook for an additional 10 minutes. Meanwhile, bring 3 cups water and rice to a boil in a saucepan. Reduce heat to medium-low, cover, and simmer until rice is tender and water has been absorbed, 20 to 25 minutes. 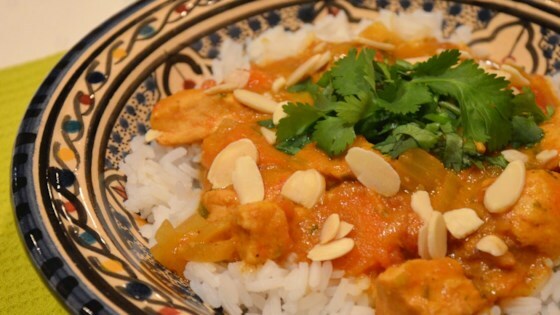 Serve curry over rice, sprinkled with remaining cilantro and sliced almonds. Have used this recipe a couple of times...and love it in the slow cooker. I also have used various types of chicken and they all work, if you don;t mind the bones.